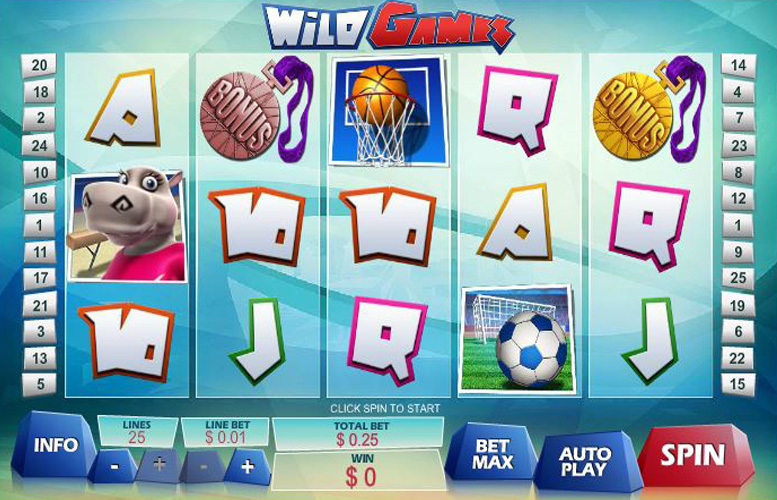 Wild Games is an Olympics-inspired slot machine with personified animals taking the place of the athletes. It has some amazing bonus features, and there’s no shortage of them either. These have been based around three popular athletics events: sprinting, swimming, and gymnastics. In terms of specifics, Wild Games has 25 win lines spread across a five reel, three row slot board. The top jackpot is 3,000 and the maximum bet possible per spin is £250. Great theme, artwork, and feel. Wild Games is fun, brightly coloured, and amusing. Fantastic bonus features. There’s loads of fully interactive side games on the title that are always fun, and sometimes incredibly lucrative. Low upper betting limit of £250 per spin. Whilst this is more than enough for many punters, some might find it limiting. “Wild games” logo = 3,000x the line bet. Bulldog, Cheetah, or Hippo = 1,000x the line bet. Football = 500x the line bet. Basketball = 200x the line bet. 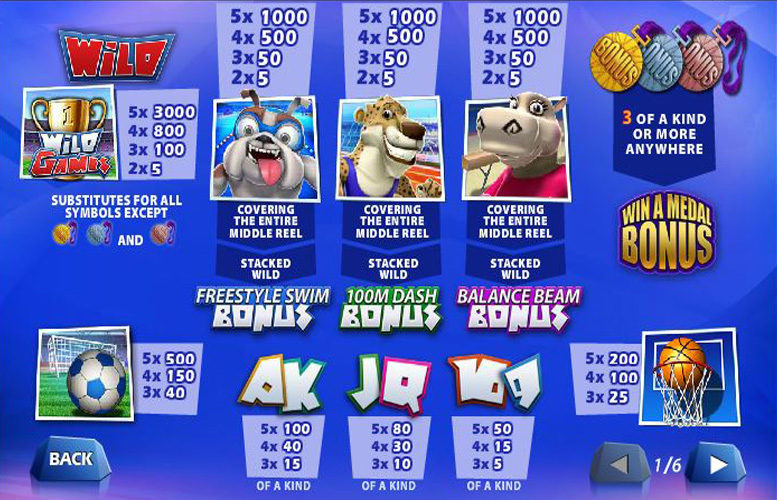 If the bulldog swimmer symbol covers the entire third reel in the main game, the Freestyle Swim Bonus is triggered. Players must choose one of the three racing hounds competing in the event. A simulation of a race takes place and either a gold, silver, or bronze medal is awarded, as well as eight free games. 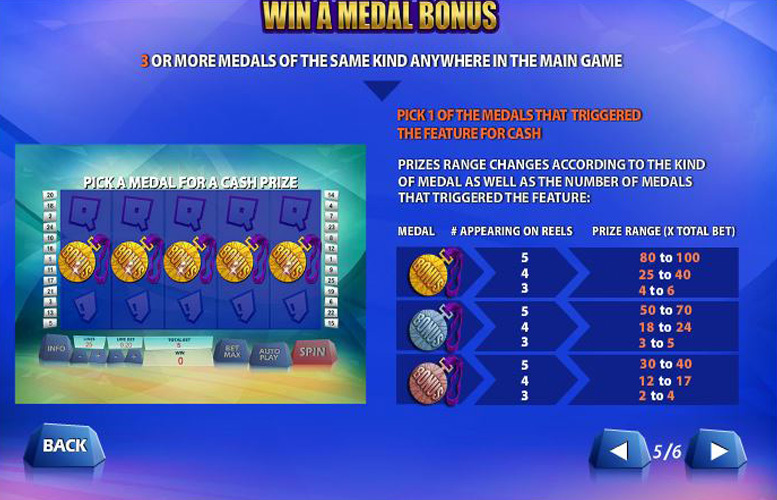 The medal won during the competition is the only one that appears on the reels and every time it lands on them, additional free spins are awarded. Gold medals pay four more free games. Silver medals pay three more free games. Bronze medals pay two more free games. During the Freestyle Free Games, the athlete symbols do not appear stacked on the third reel. Also, players should be aware that the number of free games possible is capped at 200, after which no more re-triggers are possible. Landing the Cheetah sprinter on the entire third reel during the main game will trigger the 100m Dash Bonus. The dynamic here is the same as the swim race, and eight free games and medals are won depending on the position your chosen racer finishes. Golds become extra “wilds” and “expanding wilds”. Again, the athlete symbols are not stacked on reel three, and more free games cannot be re-triggered during the 100m Dash Free Games round. Players who land the gymnast hippo over the entire third reel in the game will trigger the Balance Beam Bonus. They must select one of three balance beam routines, and the judges will rate the performance, and award players with eight free games. Free Games will be played with a multiplier that is the average of the judge’s scores. The top score is 10x, and the average score will not be lower than 6x. No medals appear on the reels during the Balance Beam Free Games and cannot be re-triggered at all. Players should note that Win a Medal Bonus, 100m Dash Bonus, Freestyle Swim Bonus, and Balance Beam Bonus cannot be triggered in any of the bonus features either. Landing three or more medals of the same kind anywhere on the reels during the main game will trigger the Win a Medal Bonus. Players must pick one of the medals that triggered the feature for instant cash. The prize range will depend on the number of medals that triggered the bonus as well as the type of medal it was. Ace, or King = 100x the line bet. Queen, or Jack = 80x the line bet. Ten, or Nine = 50x the line bet. Players can adjust both the number of win lines and the amount they want to bet on each of them. 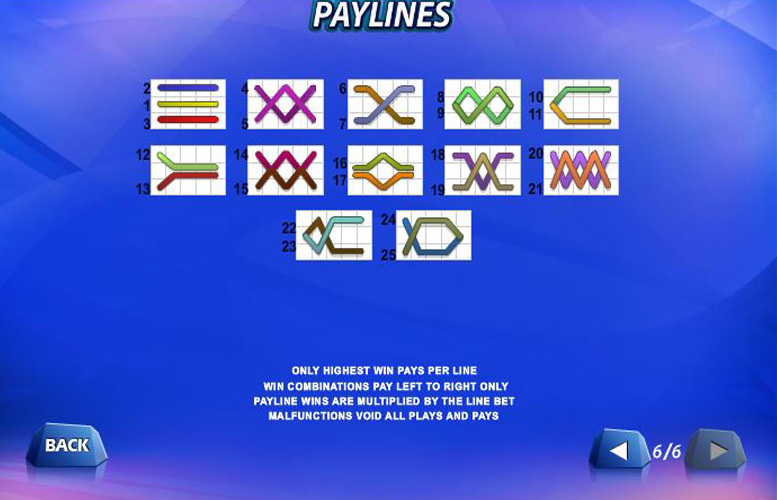 Win lines range between one and twenty-five, and line bets are between 1p and £10. This makes the lowest possible bet per spin just 1p, and the highest £250. Whilst this will be more than enough for most players, the very highest rollers might find it a little limiting. Wild Games is a great slot machine. It’s a fun themed game in which the bonus features are plentiful and relevant. The only thing that could be considered as negative about the whole package is the lower betting limits per spin. Granted, most punters won’t even notice this but higher rollers out there will probably find £250 a spin a little limiting. This game has a rating of 5 / 5 with 611 total reviews by the users.